On naturally formed lakes, native plant communities evolved, that created a continuum of vegetation, starting on the landward side with upland species and continuing downslope towards the lake where emergent, floating, and submergent wetland vegetation would be found. These native plant communities would overlap and provide a continuous cover of deep-rooted vegetation that bound shoreline soils together, preventing erosion from wave or ice action, while also providing diverse habitat for aquatic and terrestrial wildlife. Lake shorelines also provide an appealing habitat for humans as well, and lake shorelines were often significantly altered by lakeshore landowners. In-lake vegetation was, and still is, often removed by landowners not wanting “seaweeds” along their shorelines. Other landowners would fill lakefront areas with soil to elevate low-lying shorelines and make them more suited for turfgrass lawns. Sometimes, vertical concrete, steel, or wood seawalls were installed, creating an abrupt transition. All of these impacts created highly artificial shoreline environments that cumulatively can have an adverse impact of the water quality and ecological health of the lake. 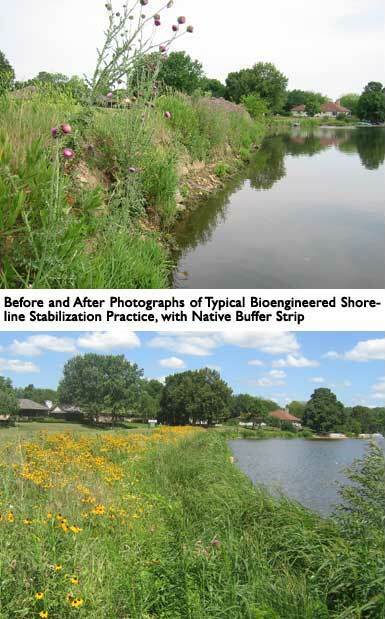 For these reasons, the recent trend in shoreline management has been to try to replicate “natural” conditions along shorelines, using what are called “bioengineering” approaches. In some cases, where the “natural” shoreline gradient still exists, native shoreline plants can be planted to re-establish shoreline stability and wildlife habitat. In shoreline situations with more dynamic conditions, such as frequent water level fluctuations, wave action, or unstable soils, additional erosion control practices may have to be installed along with the native vegetation. These additional measures can include something as simple as the use of biodegradable or non-biodegradable erosion control blankets, to something as intensive as the importation and placement of large stone. Wonder Lake faces a multitude of challenges when it comes to shoreline stabilization. As an artificially created lake, the present day shoreline soils formed on the upper slopes of the stream valley the lake now occupies. Instead of having the naturally formed organic soils that would be found around a “natural” lake, much of Wonder Lake features shoreline soils that are largely comprised of clay or gravel; challenging substrates for plant establishment. As a large lake, wind-driven waves can create significant erosive forces on unprotected shorelines. As a lake with heavy recreational boating traffic, the wake resulting from passing powerboats can create significant erosive forces on unprotected shorelines. As a large lake in a northern climate, the movement of ice during the spring thaw can “bulldoze” unprotected shoreline soils. Much of the developed portion of the lake features seawalls, which can deflect and transfer wave energy to adjacent shoreline areas. Many of these seawalls are also approaching the end of their useful lifespan, and are beginning to fail. For these reasons, shoreline stabilization on Wonder Lake will typically require the use of more “robust” practices, that provide some measure of structural stability. In areas of the lake where there are steep offshore “drop-offs”, a seawall may be the only viable option. However, along most of the shoreline, other alternatives to seawalls would be available. The most likely approach is to use “rip-rap” as the structural portion of the stabilization effort. Rip-Rap is large quarried limestone, that has the advantage of being very angular, meaning that when it is installed, it tends to lock together. This is in direct contrast to the use of rounded, glacial boulders, which from the day they are installed are fighting wave and ice action, as well as gravity, to remain in place. One key to using rip-rap is to use appropriately sized stone. On a lake the size of Wonder Lake, the use of rip-rap smaller (on average) than a soccer ball, will likely be a short-term solution, as it can be easily dislodged. Another key to using rip-rap is to install it where it will do they most good. In the past, there was a tendency to install the rip-rap on a steeply sloped plane, and to completely cover an eroding shoreline to an elevation far above where any normal water level fluctuation or waves would reach. This approach also put a great deal of weight on the upper slope, and could actually contribute to slope instability. The most successfully use of rip-rap on lake shorelines is to install it on a more horizontal plane, with most of the rip-rap volume installed below normal water level. By extending offshore, the submerged rip-rap can intercept incoming waves, and begin to dissipate their energy before they hit the shoreline. This approach also creates a more stable submerged shoreline zone, into which native shoreline vegetation can be established. The detail below shows how this approach can be used on shorelines with no stabilization practices currently in place, or where existing seawalls are present. The deep penetrating roots of the native vegetation help bind shoreline soils together, and can also further stabilize the installed rip-rap. Emergent wetland vegetation provides habitat for frogs, birds, and young fish. The buffer strip can prevent lawn fertilizers from reaching the lake, reducing the potential for algae blooms. The buffer strip can also deter Canada Geese from congregating, as they prefer mowed lawns where they can have a clear field of vision for potential predators. In turn, discouraging Geese can also reduce the amount of goose “bombs” they leave behind on your lawn, which can make the lakeside environment a nicer place to walk or rest, as well as reduce the bacterial impacts to the lake. It is certainly recognized that lakefront landowners will still want to access the lake, and for that reason, access routes through the buffer strips / shoreline practices for piers, lake-view vistas, or fishing points are specifically designed into these projects, so landowners don't feel "cut-off" from the lake. For these, and many other reasons, regulatory agencies are strongly encouraging “bioengineering” type practices, and only allowing seawalls to be installed or replaced at locations where no feasible alternative exists. Similarly, agencies dealing with water quality can offer grant programs to help cost-share the installation of bioengineered practices. Simply stated, the more you can replicate “natural” shoreline conditions, the more successful your efforts will be. The following are links to a variety of websites dealing with shoreline stabilization, buffer strips, and other related topics. Please note that some of these sites are from outside Illinois, and may refer to regulatory programs that do not apply in Illinois. For more information on regulatory permits needed for shoreline work on Wonder Lake, please go to the “permits” tab under the Lake Manager Page of this website.